When I began planning the Caroline Abbott books for American Girl, I quickly decided to make Caroline’s father a shipbuilder. The war in the Great Lakes was largely a naval war, and I wanted Caroline and her family to be part of it. There was a large and well documented naval shipyard in Sackets Harbor, New York. Builders there worked on huge ships like the Oneida. This photo was taken many years after Caroline’s time. The US Navy’s shipyard produced ships that towered over the village. I squeezed the fictional Abbott’s Shipyard just down the shore from the naval yard in Sackets Harbor. It wouldn’t have made sense to have the men at Abbott’s also building enormous vessels. Instead, I decided that Caroline’s family shipyard would produce gunboats. While writing the series, I studied pictures of gunboats. Recently, however, I got to see a real one! Part of one, anyway. That’s me looking at the remains. You can get a sense of the boat’s size. 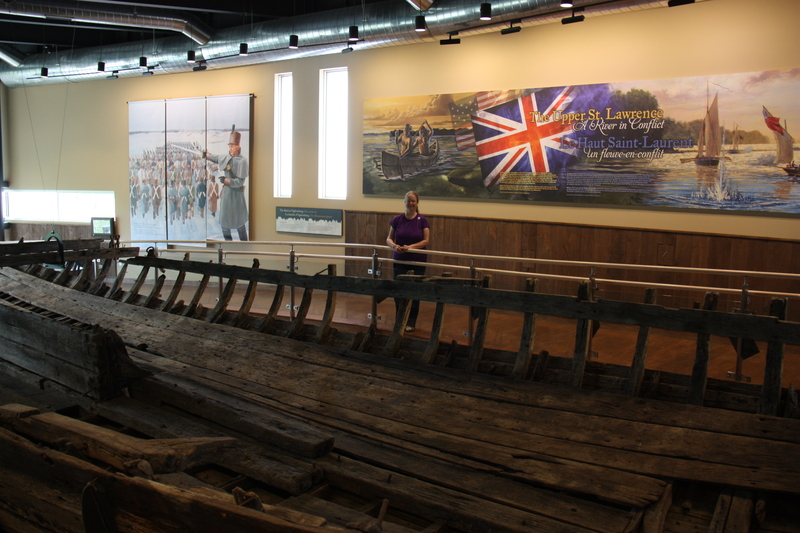 A sunken British gunboat was discovered decades ago in a small inlet on the north shore of the St. Lawrence River. Only the bottom, or hull, remained. Over the years, shifting ice likely tore the upper wood away. The location is about 30 miles from the eastern end of Lake Ontario. 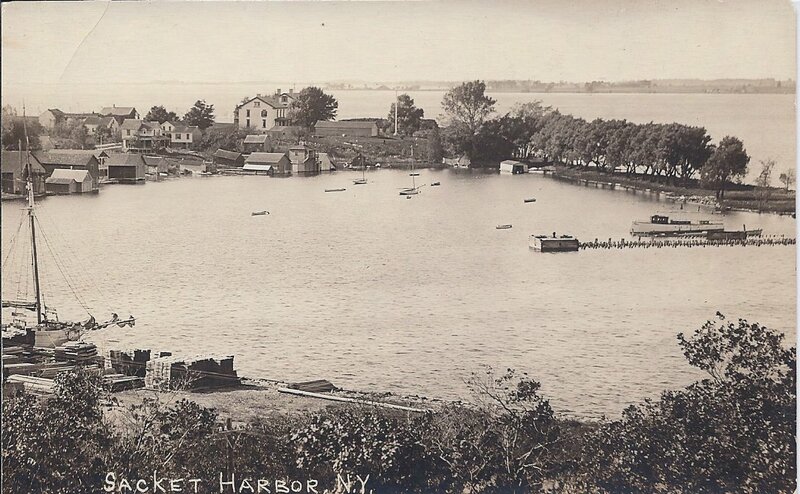 (Sackets Harbor, where Caroline lives, is very close to that eastern end of the lake.) 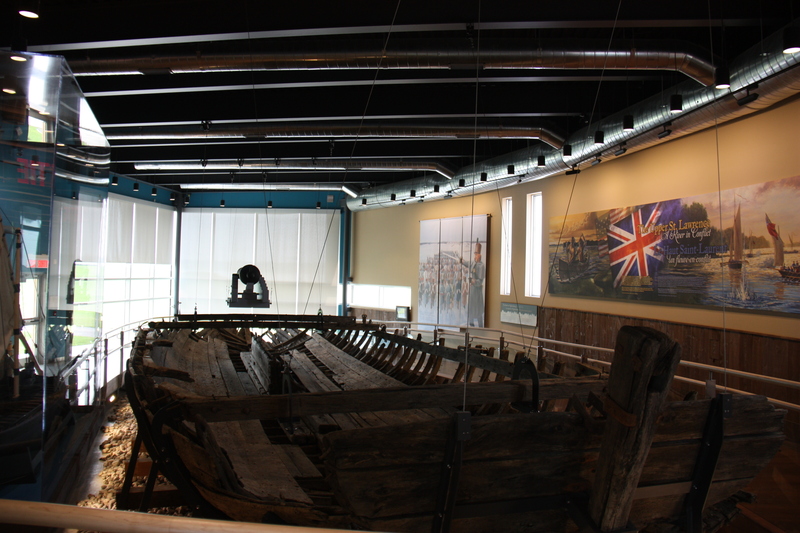 Naval historians believe this boat was built during the War of 1812. Parks Canada Underwater Archaeology Service raised the remains of the shipwreck in 1967. As you can imagine, it was tricky work! 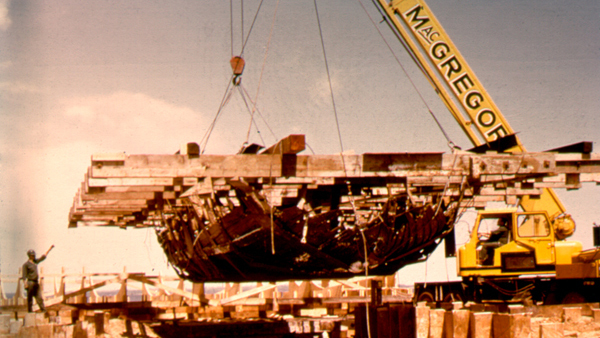 The shipwreck being raised in the 1960s. Parks Canada photo. 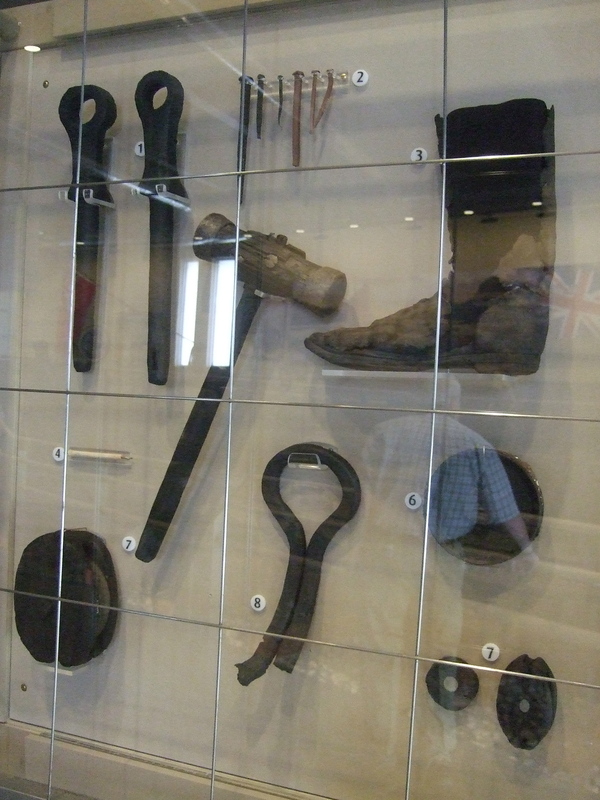 The remains are now safely exhibited at Fort Wellington National Historic Site of Canada, which is a wonderful place to learn more about the War of 1812 in the area were the Caroline books are set. 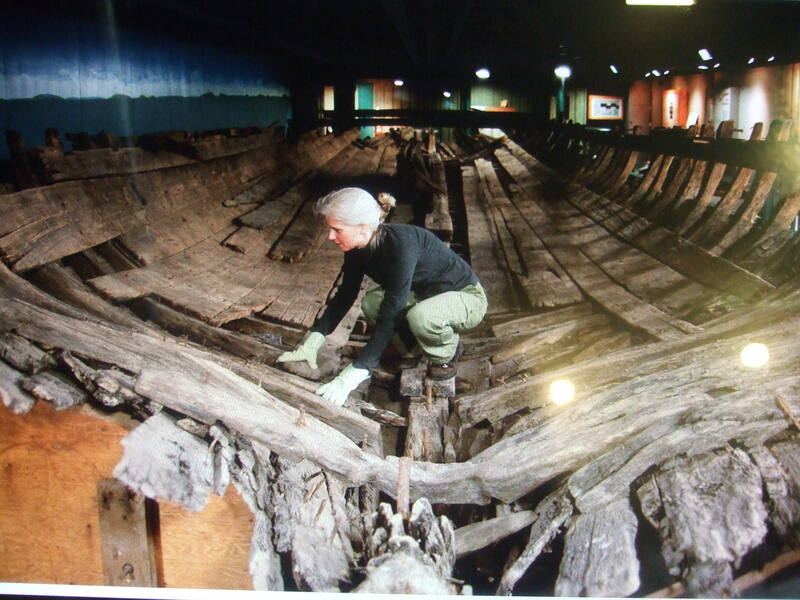 Parks Canada Conservator Flora Davidson secures loose parts of the gunboat wreck at St Lawrence Islands National Park in Mallorytown in preparation for its move to Fort Wellington in Prescott, Ontario. Parks Canada photograph. Gunboats were of vital importance on Lake Ontario during the War of 1812. They were shallow boats designed to carry one or more guns that could fire on other ships or on targets along the shoreline. They were also used to carry supplies or troops. Gunboats had sails, but they also carried long oars called sweeps, which required six or eight men to row. 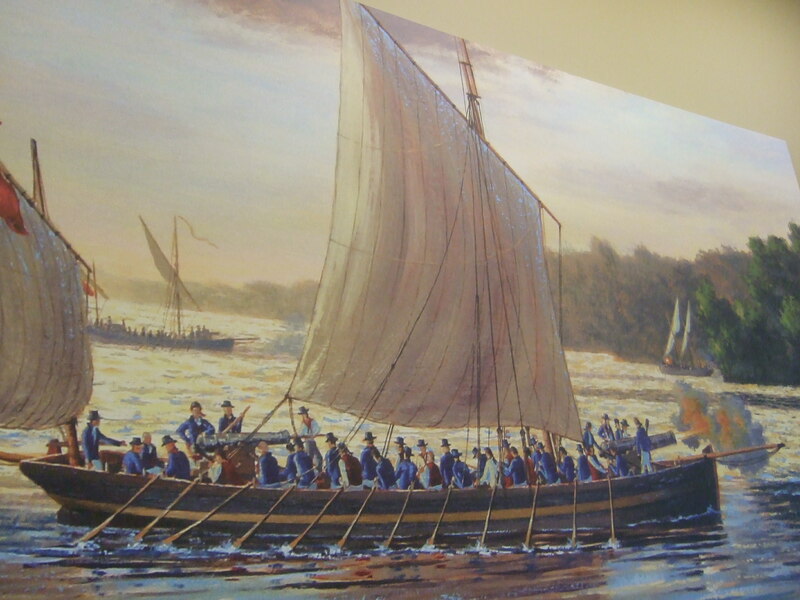 The gunboat at Fort Wellington is displayed in an exhibit that includes this marvelous painting, making it easy to imagine how it was originally used. Exhibit artwork by David Kanietakeron and Peter Rindlisbacher. 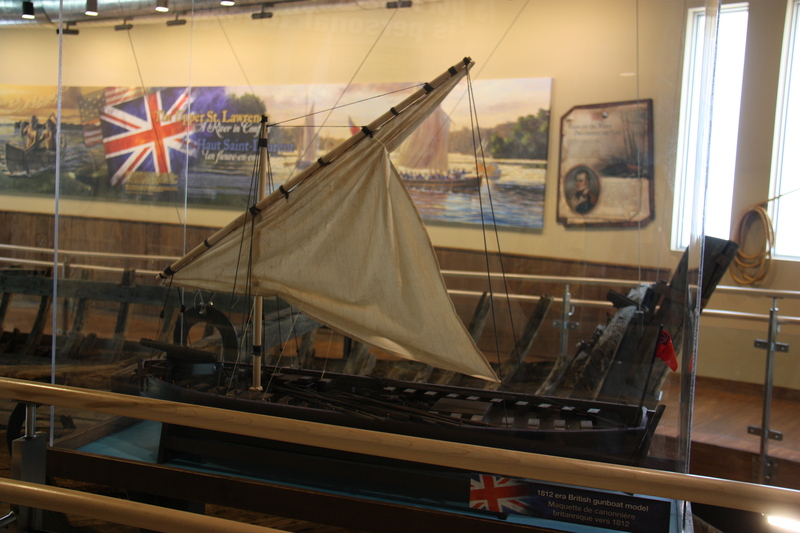 And here’s a model of what this gunboat probably looked like. You can compare the model and the painting with what’s left of the vessel. 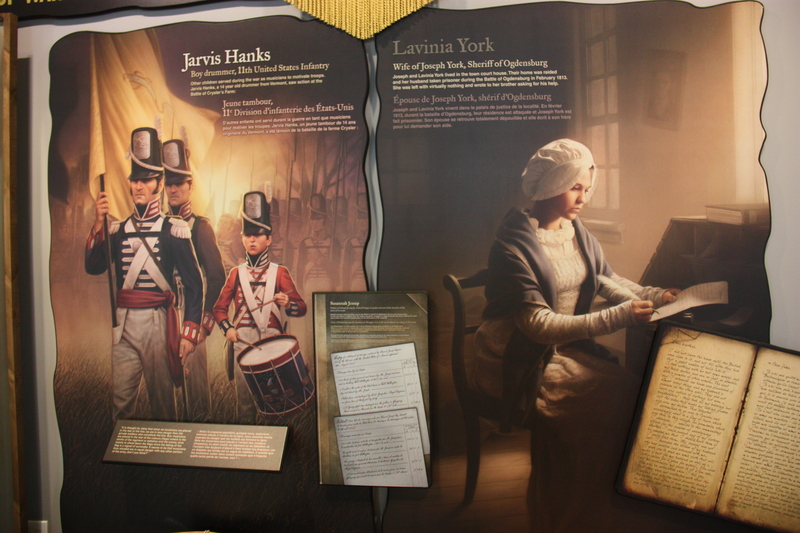 Other exhibits tell different parts of the War of 1812 story, and helped me imagine life during Caroline Abbott’s time. Jarvis Hanks was a young drummer boy from Vermont. Lavinia York was the wife of the sheriff of a border town in New York. Letters and other writings left by people who lived during the War of 1812 provide wonderful glimpses of the past. Original nails, tools, and a man’s boot—just as Caroline might have seen them. This exhibit painting suggests what a home in Prescott, Ontario (Upper Canada) might have looked like. 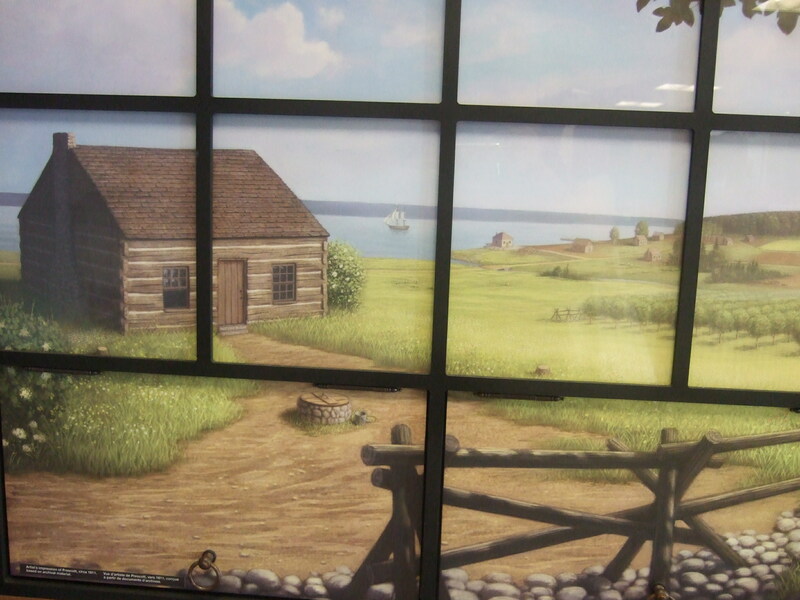 (It reminded me of Caroline’s cousin Lydia’s farm in Upper Canada!) Prescott is right across the St. Lawrence River from Ogdensburg, New York. After reading about and thinking about and imagining gunboats, it was exciting to see the bones of a real one on display! If you have a chance to explore Sackets Harbor, New York, I highly recommend a sidetrip to Fort Wellington National Historic Site in Prescott, Ontario.